Take a walk on the wild side with an evening tour through Shinjuku, Tokyo’s famous entertainment district, and get a local's look into the best shopping and night life. Discover the Omoide Yokocho, an alley lined with tiny hole-in-the-wall restaurants serving delicious street food, the notorious red-light district of Kabukicho and more! 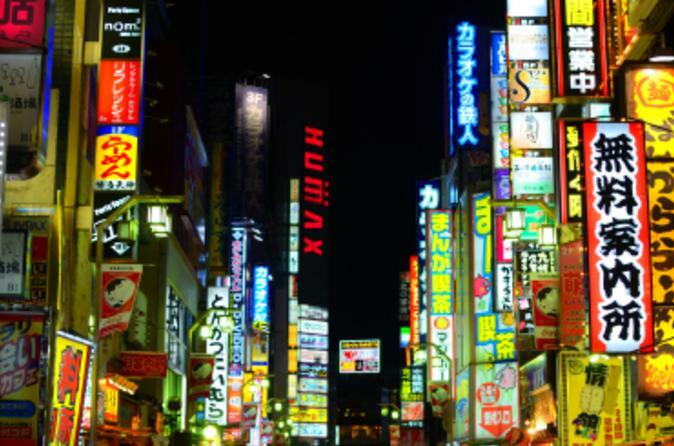 Start your exciting night tour at the shopping area of Shinjuku and check out the popular department stores where Japan's trendiest styles and subculture fashions are to be found. Walk past the Suehirotei Vaudeville Theater, one of the most prestigious traditional Japanese theater companies. Admire the candle-lit Hanazono Shrine, founded in the mid-17th century and considered a protector of the Shinjuku district. Continue your walk to Golden Gai Street, a famous bar district on the east side of Shinjuku with more than 100 tiny shacks (formerly brothels), bars and clubs. Walk through the narrow alleys and passageways that have remained unchanged over time. Stroll along the neon-lit streets of Kabukicho, full of small bars and hostess clubs catering mainly to Japanese salary men. Stop by an izakaya, Japanese -style bar, and enjoy 1 complimentary drink. See the touts calling out for business and hear the risqué stories of what goes on behind closed doors! Finish your tour at Omoide Yokocho, for a look back in time. This lane still has the old architecture of wooden shacks and is reminiscent of the 1940s when old Tokyo’s alleys hosted a world of black marketeers. Stop for a while and enjoy dinner or a few drinks at one of the many bars and restaurants. Please note: Food and drinks are not included in the tour, your guide will suggest restaurant and bars and assist you with ordering.